If you’ve ever experienced someone in your family express their desire for fast food, they’ll be impressed and surprised when you can make their favorite fried foods from your very own kitchen. 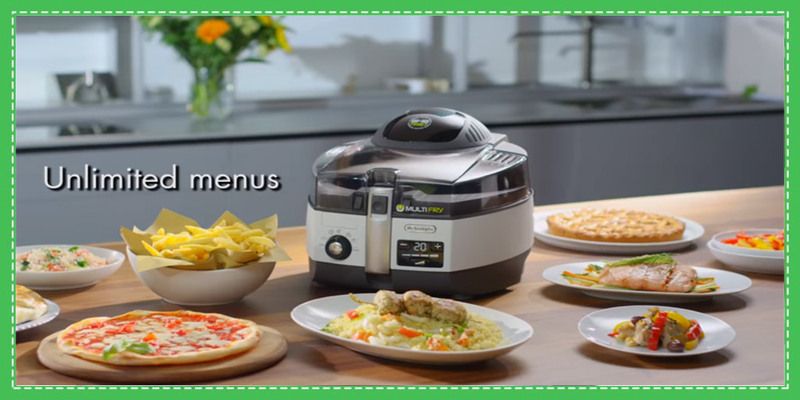 There will be no need to run out to a fast food restaurant every time you’re craving some comfort food because this DeLonghi Multifry FH1163 air fryer makes it easy to fry anything you desire. One of the best Air Fryer and Multi Cooker with unique features. You can cook almost anything, such as fries, veggies, shrimp, mozzarella sticks, and chicken wings can all easily be done with little to no hassle. Since this appliance features a rotating basket, you can feel good about knowing that you’re only using half of the oil you would use in any other deep fryer model. Since you can reuse the oil a couple of times, you have the option of choosing a more expensive and healthier oil to fry your foods in. Save time: The multifry is equipped with an automatic mixing paddle. This feature allows you to do something else while Multifry cooks and stirs the food for you. Rapid cooking: The cooking time is reduced because of the innovative construction of two heating elements. They provide radiant and convection heat for a perfect cooking process. Capacity: This fryer can hold up to 3.3 lb capacity and will have about 8 servings. Easy to use: The oil draining system means there is no mess or cleaning up after using the airfryer. There will be no need to drain and strain the oil yourself because the appliance does it all for you with the utilization of a simple hose. Adjustable thermostat: The fryer can be set between 300 and 370 degrees, so you can choose your temperature based on what you’re frying. The interior of the fryer is non-stick, so there’s no messy cleanup afterwards. The magnetic cord allows you not to worry about the fryer around children or pets since it will just detach from the appliance if pulled on. The dual filtration filters ensure that no greasy oil scent is expelled into your kitchen. The condensation shield works well to make sure that no oil will drip on the cord or your cooking area. The clear lid makes it simple and easy for you to check on your food without opening while the cool touch handle allows you to take the basket in and out of the oil without opening the lid. The outside of the fryer has a cool touch exterior that makes this a perfect appliance for those with children. No more worrying about them accidentally burning themselves on the walls of the machine. Though the basket rotates, it doesn’t take any additional time to fry the foods efficiently. The fryer may not reach its highest temperature – stopping short at 355 degrees F. This can result in greasy food that and also not as crispy as you would like. The magnetic power cord – helpful for reducing spills due to accidental pulling – but can be detached at the slightest tug and turn off the fryer during cooking. Although it has a 1.5-pound food capacity, it is not broad enough to cook large quantities of food is you’re cooking for a group of people. The timer is powered by a separate battery, so you may have to replace the batteries even though the rest of the appliance is powered by electricity. Q: What is SCS Technology? A: SCS is an exclusive technology made by De’Longhi that delivers high performance by surrounding the food with heat to cook the food evenly. The upper heating element and fan provides uniform heat from the top while the lower heating element delivers heat from the bottom. The mixing paddle will take care of stirring your food automatically. Q: Is this fryer healthier than others? A: De’Longhi Multifry is an innovative low-fat fryer that allows you to prepare delicious recipes with little or no additional oil. There is only 2.8% of fat for 2.2 lbs of fresh potatoes so you can enjoy your fried food a healthier way. Q: What makes this a multifryer? A: This product is considered a multifryer because you can quickly and easily prepare a variety of recipes on your counter-top – from crispy french fries to meat. Multifry also allows you to bake pizzas, cakes, and pies. Delonghi air fryer makes it perfect for those who have wanted a home deep fryer but are concerned about the amount of oil that fryers use, and the health issues greasy foods can cause. Those who have steered away from purchasing a deep fryer due to the amount of cleanup it requires can also no longer worry – the hose makes it easy to drain and store oil without any messy cleanup. The next time you want to indulge in some fried food, use your new air fryer.